At the Cardiovascular Care Center of Johnson Memorial Hospital, the attention you need is right around the corner. In partnership with IU Health Physicians Cardiology, we offer diagnostic and interventional cardiac services to identify and reverse the effects of heart disease, provide a variety of treatments of peripheral vascular disease, and have heart pacemaker services for cardiac arrhythmias. Richard Kovacs, M.D., Cardiology Services Medical Director and Clinical Director, leads a team that conducts cardiology testing and treats patients at the JMH hospital campus. Outpatient Services are being offered from 8 a.m. to 4:30 p.m. Monday through Friday. The IU team is supervising cardiology testing procedures. Cardiologists are diagnosing echocardiology and stress tests and monitoring Holter and Event procedures from the cardiology testing suite. Cardiology Inpatient and Emergency Services are also available in consultation with the JMH hospitalists. 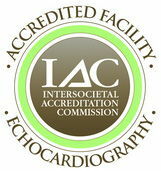 Johnson Memorial Health has earned Echocardiography Accreditation by IAC (Intersocietal Accreditation Commission). IAC accreditation is a “seal of approval” that patients can rely on as an indicator of consistent quality care and a dedication to continuous improvement. Johnson Memorial Health has been granted a three-year term of accreditation by the IAC in Echocardiography in the area(s) of Adult Stress, Adult Transesophageal, and Adult Transthoracic. Accreditation by the IAC means that Johnson Memorial Health has undergone an intensive application and review process and is found to be compliance with the published Standards thus demonstrating a commitment to quality patient care in echocardiography. The Cardiovascular Care Center is Advanced Cardiovascular Life Support (ACLS) certified. Our lab uses Definity®, an ultrasound imaging agent, that has a proven diagnostic advantage that optimizes outcomes, patient management and cost-effectiveness. The Cardiovascular Care Center is in the 1155 Building Suite 203 on on the Johnson Memorial Hospital campus. For more information, please call us at 317.736.3560.